Welcome to Lore and Saga. This site offers Viking and Roman information, resources and living history services for teachers, museum or heritage professionals and others with an interest in living history. 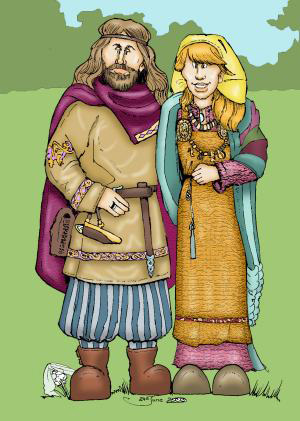 Through these pages you can book a Viking or a Roman to visit your school, or an ancient craft demonstration for your museum or heritage site. Perhaps you want to know how to light a fire with flint and steel, you can find things like that here too, but you will sometimes have to be a detective and search for answers in hidden places. My name is Wayland and I welcome you to the World of Lore and Saga. Lore and Saga has been set up especially to meet the needs of teachers, educational providers and museums by delivering the highest quality Living History services in accessible and affordable forms. Based in the North West of England we specialise in Iron Age Celtic, Roman, Saxon and Viking presentations and demonstrations. Unlike many other organisations covering these periods we do not present combat displays. We’re interested in Living History not Dying History. Probably the most important battle that most of our ancestors faced was the day to day struggle to put food on the table and keep a roof over their heads. So if you are looking for a Viking or Roman School talk, a demonstration of Viking Silversmithing, an Iron Age Metalworking display or a host of other Celtic, Roman, Saxon or Viking services you have come to the right place.